Marion Local’s Sam Huelsman pressures Seneca East quarterback Chase Foos during Friday night’s Division VI state semifinal at Spartan Stadium. Marion Local’s Darrin Hays fights for yardage against Seneca East’s Blaine Swartzmiller during Friday night’s Division VI state semifinal at Spartan Stadium. LIMA — Seneca East ran into a heavy dose of 10-time state champion Marion Local. And it didn’t turn out well for the Tigers. Marion Local dominated Seneca East with a 34-6 steamrolling to win the Division VI football state semifinals Friday at Spartan Stadium. Marion Local (13-1) will meet the Kirtland, a 35-18 winner against Beverly Fort Frye, next weekend for the state championship at Canton’s Hall of Fame Stadium. The day and time next week have not been announced. 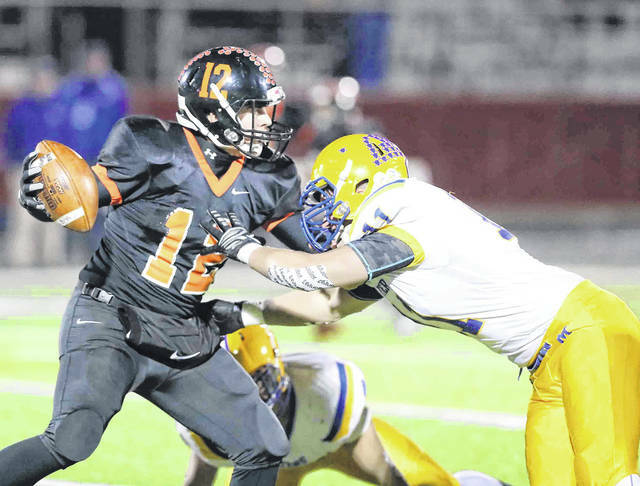 Seneca East, which won its only three football playoff games this year, ends its season 12-2. 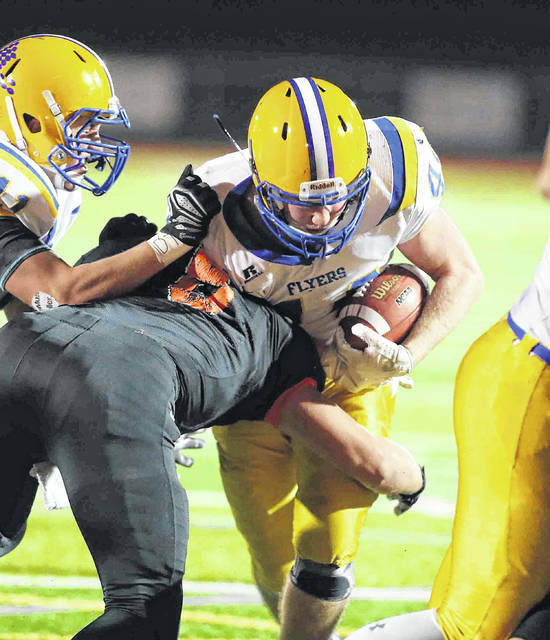 Marion Local did a little of everything and its first-team defense was too much for the Tigers. On the ground, Marion Local was led by Nolan Habodasz, who had 14 carries for 110 yards. He had a 54-yard TD run. In the air, Marion Local quarterback Nate Bruns completed 10 of 16 passes for 157 yards with two TDs. Nick Tangeman had two catches for 77 yards, with a 65-yard TD down the sideline. In the opening half, the Flyers ran nearly at will and formed a stone wall to stop Seneca East 2,300-yard rusher Blake Swartzmiller. The 6-foot-3, 235-pound Swartzmiller finished with 15 carries for 72 yards, but the bulk of those came on his team’s final drive against the Marion Local backup defenders. “We saw a couple of pretty good backs (in the Midwest Athletic Conference),” Marion Local coach Tim Goodwin said. “He (Swartzmiller) was pretty comparable to St. Henry’s running back (Zach Niekamp). They are about the same stature, but he was the player of the year in our league, too. That’s a credit to this kid, too. Marion Local romped down the field and scored the first three times it touched the ball. The Flyers led 14-0 after the first quarter and 27-0 at the half. The first time the Flyers got the ball they went 75 plays over seven plays for the score. Habodasz took a pitchout around the left side and breezed to a 54-yard TD. That gave the Flyers a 7-0 lead with 6:49 left in the opening quarter. The second time Marion Local got the ball they rumbled 68 yards in nine plays for the TD. Fullback Brandon Fleck plowed over left tackle for a 2-yard TD. That gave Marion Local a 14-0 lead with 2:36 left in the first quarter. The Flyers pushed their lead to 21-0 after the third time they had the ball. “We played pretty well,” Goodwin said. Marion Local went 45 yards in nine plays for its third score. Fleck again bulled over from the 1-yard line and it was 21-0 with 8:42 left before halftime. Next it was time for the Flyers’ defense to set up the offense with an interception by Grant Meier at the Tigers’ 33. Marion Local needed only two plays to cover the 33 yards for its four score. Bruns hit Habodasz on a screen pass down the left sideline for a 33-yard TD. “After that first drive, the line was giving me some holes and I liked it,” Habodasz said. That gave the Flyers a 27-0 lead with 29 seconds left before half. Marion Local led 34-0 before Seneca East scored on the final play of the game. Tigers quarterback Chase Foos completed 12 of 30 for 86 yards and had one interception. The Marion Local line swarmed Swartzmiller and held him to six yards on six carries at the half. Meanwhile Habodasz had 87 yards rushing and 35 receiving at the break. Marion Local will aim for its 11th state title, including winning the championship in 2016 and 2017.